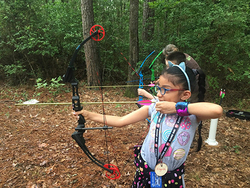 Learn various survival skills, including archery, orienteering and plant identification during Archery and Survival Supermarket Family Day, an event sponsored by Stephen F. Austin State University's SFA Gardens and the student chapter of the National Association of Interpretation. This free event is scheduled from 10 a.m. to 1 p.m. Saturday, Oct. 13, at the Pineywoods Native Plant Center, located at 2900 Raguet St.
NACOGDOCHES, Texas - Join Stephen F. Austin State University's SFA Gardens for a free outdoor family day featuring archery, the Survival Supermarket and guided plant identification hikes led by students from the National Association of Interpretation, from 10 a.m. to 1 p.m. Saturday, Oct. 13, at the Pineywoods Native Plant Center, located at 2900 Raguet St.
Children are encouraged to learn introductory archery skills from a team of trained SFA student instructors. Other activities include a shopping trip through the Survival Supermarket to learn about the traditional uses of the cattail plant, introduction to orienteering and compass skills, creating plaster casts of animal tracks, hiking with NAI students on plant identification walks, and more. "Cattail is one of the most versatile plants when it comes to survival scenarios. It can be used for food, fuel and pillows," said Jocelyn Moore, assistant education coordinator at SFA Gardens. "We are excited to invite participants to explore this plant and others as they browse through the Survival Supermarket." The event is held in conjunction with the Nacogdoches Public Library's Big Read of 2018, where more than 40 events are held throughout Nacogdoches that explore the theme "Survival Is Insufficient," which is discussed in the book "Station Eleven" by Emily St. John Mandel. According to librarian Crystal Hicks, the Big Read aims to "broaden our understanding of our world, our communities and ourselves through the joy of sharing a good book." Event parking will be at the PNPC and Raguet Elementary. For more information, call (936) 468-1863 or email moorejv@sfasu.edu.